Farming in the Bampton area has been a major feature for thousands of years. Devon as a whole is well-known for its high quality farm produce and locally produced food. 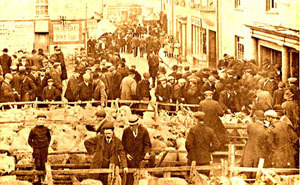 The early photograph on the right shows sheep sales in the middle of Bampton in about 1890. 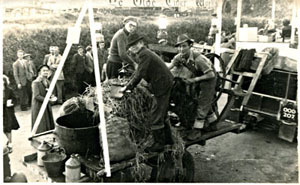 This would have been on Bampton Fair day when many local farmers brought livestock into the town to be sold. In the 19th century it is recorded that as many as 14,000 sheep were traded on a single day! This photo of about 1907 shows a period of time between horse-drawn vehicles and the modern tractor. At the back and on the right you can see a pony and cart. 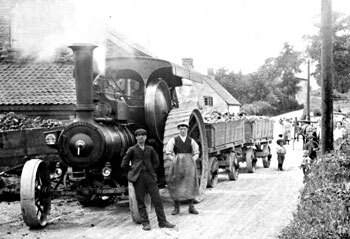 This steam traction engine is being used to haul trailers through Petton, just a couple of miles from Bampton. The engine says 'Dreadnought' on the front - note its two oil lamps for working late into the evenings. In the Bampton area you will not find fields of crops such as cereals or vegetables - the ground is not flat enough for intensive agriculture! However the Batherm valley and the upper reaches of the Exe valley are quite lush with grasslands, and you will see dairy farming including, on the edge of the town, Weston's farm with its local creamery. There were once several apple orchards in Bampton, and one still remains at Millennium Green next to the school. This photo shows a float at Bampton Carnival (1960's?) showing the cider-making process - the crushing of the apples to make pulp, and the collecting barrel on the left. Note the old stone cider jars at the back of the trailer. Higher up towards the moors it is predominately sheep farming, and sheep can be seen roaming freely on the hillsides. Every now and again the flocks need to be returned to the farms for shearing or for lambing, and on these occasions they are driven through the streets of the town to the enjoyment of the passers-by, although it is wise to keep them out of your garden! 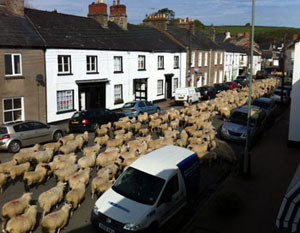 This photo shows quite a large flock being driven down Brook Street in the middle of the town in 2013.